Sitting amidst mid-20th century memorabilia and iconic imagery in the reconstructed office of longtime Coca-Cola Company CEO and board chair Robert W. Woodruff, Carletta Ooton posits the company’s current-day quality promise: “Deliver perfect product, trusted everywhere.” Bold yet simple, don’t you think? While talking with Carletta, The Coca-Cola Company’s chief quality and product integrity officer, I’ll admit my mind wandered, just a bit. Woodruff’s workplace had me wondering about his and the company’s commitment and quality practices in the 1920s. What were the process maps? What did they root-cause analyze? And how did the business and quality management and systems grow, evolving from syrup and soda fountains to packaging and bottling and global operations and distribution and brand? In these ASQ interview videos, Ooton reminds us that Coca-Cola promoted its product quality in the 1920s, saw it as a competitive advantage, and continues to do so today. Product quality is at the core of the 500 sparkling and still brand beverages produced by the world’s largest beverage company. Experience quality, Ooton notes, is in the refreshed thirsts of 1.7 billion servings consumed per day. Consumers become loyal, enthused, effervescent brand enthusiasts. Does your organization have such enthusiasts? How and why did Coca-Cola customers become such an energized base? As Ooton’s comments convey, quality at The Coca-Cola Company is, now more than ever: product and packaging that is safe and that can be trusted, and mindful and sustainable business practices—wherever products and plants are. Quality is also in the feeling, emotion, and inspiration people associate with its advertising (“I’d like to teach the world to sing…”), with pictures of The Coca-Cola Santa. It’s in the very “bottle” itself, glass or aluminum. 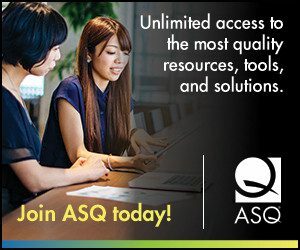 In this interview, Ooton’s remarks range from the quality maturity continuum to the challenges of local production and global quality systems, to the blessing and challenges of working as “stewards of the world’s most valued brand.” And she speaks about ASQ, and her expectations of the world’s largest quality community as an Enterprise Quality Roundtable member. Take a look, with the beverage of your choice in hand, of course. How Does Coca-Cola Symbolize Quality–in the U.S. and Globally?